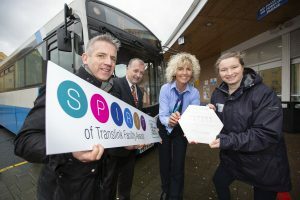 Seven Translink stations have received Platinum SPIRIT of Translink Facility Awards, with Newry train station scoring 100%. Newry Buscentre also achieved a Platinum award. The Awards, in partnership with Keep Northern Ireland Beautiful, are judged across key criteria assessing resource efficiency, energy and carbon, biodiversity, health and wellbeing activities; stakeholder, employee and community engagement as well as employee culture, behaviour and leadership. They embrace Translink’s corporate responsibility themes – Go Safe, Go Eco, Go Healthy and Go Together. Newry train station achieved the maximum score of 100%, while Newry Buscentre also received a Platinum Award. Downpatrick Bus station; Antrim Bus and Train station; Foyle Street Buscentre; Craigavon Bus Station and Strabane Bus Station also achieved Platinum status. 36 Translink bus and train stations and depots took part in the 2018/2019 Awards and Translink plans to further expand the scheme with a commitment to enhancing customer experience and safety. The initiative also ensures adherence to the environmental-responsibility focus, making Northern Ireland a more attractive place to live and work while supporting the local economy. Translink Environmental Manager Andy Bate said: “The judges gauge how our employees contribute to delivering our corporate values; what we call the SPIRIT of Translink – Safety, People, Innovation, Responsibility, Integrity and Teamwork, making a positive and lasting difference, improving the passenger journey experience, demonstrating the company’s corporate responsibility focus and instilling a sense of pride in our work space. 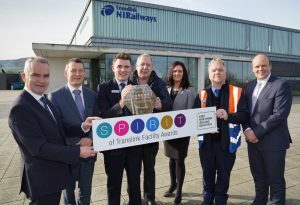 Newry NI Railways station has scored 100% in the SPIRIT of Translink Facility Awards. Pictured at the Awards presentation are: Translink Group Chief Executive Chris Conway, Ian Humphreys, Keep Northern Ireland Beautiful; Peter O’Hare, Newry NI Railways, Aidan Kennedy, Gemma McMurray, Gary Harte and John Thompson, Health and Safety Manager, Translink.